PASADENA, Calif. — A federal appeals court has ruled in favor of a Christian who was arrested six years ago for reading the Bible aloud outside of a California Department of Motor Vehicles (DMV) office. The Ninth Circuit Court of Appeals overturned a lower court decision on Wednesday that granted summary judgment to the police officer who arrested Mark Mackey for his Bible-reading. Mackey had civilly sued the officer following his arrest, a legal challenge that was then placed on hold until after he was exonerated in criminal court. 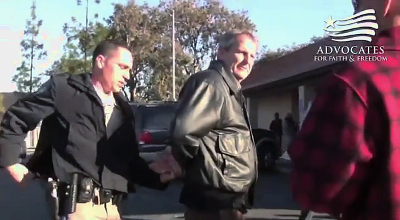 As previously reported, the incident occurred in February 2011 when Mackey, along with his pastor, Brett Coronado, and their friend Edward Florez, Jr., went to the DMV in Hemet early one morning to evangelize those who were waiting for the facility to open. As they stood in the publicly-owned parking lot, approximately 40 feet from the entrance, Mackey began to read out loud from the Bible. However, soon after, he was approached by a security officer at the DMV, who asked him to move elsewhere. The men then asserted that they had a First Amendment right to engage in their activities, and Mackey continued to read from the Scriptures. “This is what the United States is coming to,” Mackey began to call out, holding his hands behind his back. “You can preach on your own property,” Meyer said. “What law was he breaking?” Coronado and Florez asked. After being released, the men retained the help of the Christian legal organization Advocates for Faith and Freedom, which soon filed a federal lawsuit against Meyer and California Highway Patrol. However, Riverside County District Attorney Paul Zellerbach responded by charging two of the men, Mackey and Coronado, with trespassing for failing to obtain a permit to conduct a “demonstration or gathering in or upon any state buildings or grounds” and ordered the Christians to stand trial. Prosecution had to prove at the 2013 trial that the men were engaged in a “demonstration or gathering” and had to establish that the men drew a crowd, as opposed to merely speaking in the vicinity of those who were waiting in line to enter the DMV. But as prosecutors did not meet the burden of proof, Mackey and Coronado were declared not guilty. In light of his exoneration, Mackey requested that his civil suit consequently be resumed. In 2015, District Court Judge Molly Gee granted summary judgment to Meyer, who argued that he was entitled to qualified immunity because he had reason to arrest Mackey. But Mackey appealed, and this week, the Ninth Circuit reversed Gee’s decision, opining that Meyer was rather in the wrong to arrest Mackey. It also found discrepancy between Meyer’s assertions and the video evidence. “That version of events is completely belied by video and audio footage which does not reveal any confrontations whatsoever, and merely shows Mackey reading the Bible aloud somewhat apart from people standing in line,” the court noted. It also found that Meyer never asked Mackey whether or not he had a permit, so to arrest him for trespassing by failing to obtain a permit was unwarranted. The judges remanded the case back to the lower court to handle further proceedings accordingly.